These Caterpillars are grey and hairy with a brown head. They are famous for walking in processions. Their hairs are thought to cause skin rash ( urticaria ) in sensitive people, although it has been asserted that it is the hairs on the dead larval skins and adult moths that cause these problems. The rash can last for months after the exposure, and easily become infected. Not only do humans suffer from irritation from the hairs. The hairs have also been implicated in causing abortions in horses, by puncturing the intestinal walls allowing infection by pathogenic bacteria. Beefwood ( Grevillea striata, PROTEACEAE ). 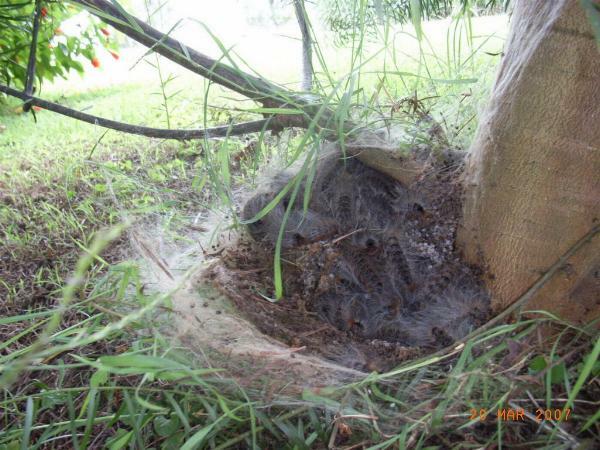 During the daytime, the Caterpillars hide communally in a nest, a shelter of silk, frass, old skins, and other debris. Sometimes this is located on a shoot at the end of a branch, or sometimes high on the trunk. Sometimes this is located on the ground at the base of the foodplant. The different nesting habits are evidence that there may be two or more species currently being included under this name. 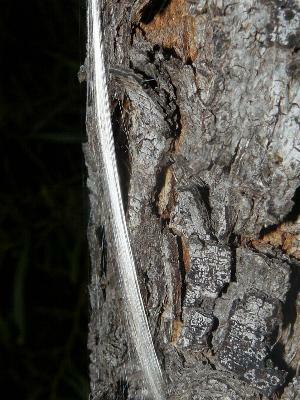 The hairs from old skins in such a nest can get blown around and spread over adjacent vegetation, which is of concern for humans and animals in the area. The presence of the nests of these caterpillars on properties with breeding horses has been associated with spontaneous abortions in these horses. The case is not proven, and mechanisms for such a cause and effect are unclear. The only reasonable suggestion so far has been that possibly the hairs carry pathogenic bacteria, whose infection causes the abortions. Much work needs to be done to investigate this properly. When mature, the caterpillars go walkabout to find somewhere to pupate, having grown to a length of about 4 cms. 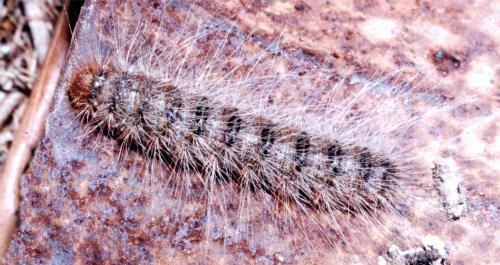 The Caterpillars also go walkabout if they totally defoliate their food tree and have to locate another one. Each Caterpillar when it walks, leaves a trail of silk from its spinneret near its mouth. 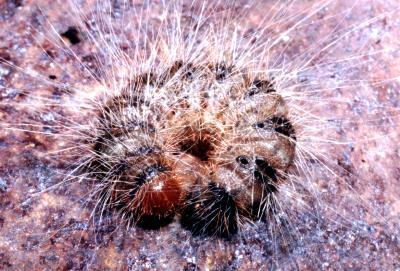 When a Caterpillar of this species encounters such a silken trail, it starts to follow it. Thus the Caterpillars when they walk are inclined to follow each other, nose to tail, like a minature freight train. 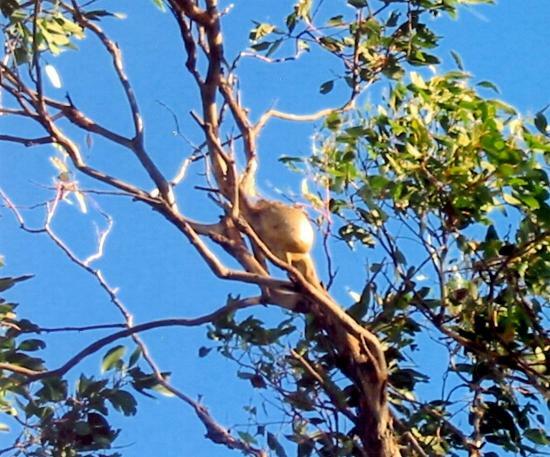 Cathy Mardell of Port Macquarie reported counting 203 in one such procession. They pupate in a silk cocoon in ground debris. 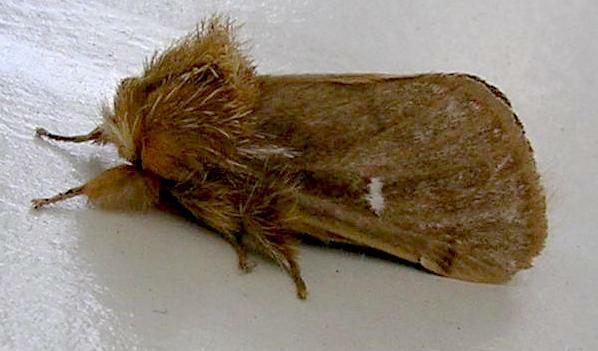 The adult moth have a wingspan of about 4 cms. They have forewings that are dark grey or brown, and hindwings that are white shading to grey at the base. Some have a pale dot in the centre of each forewing. 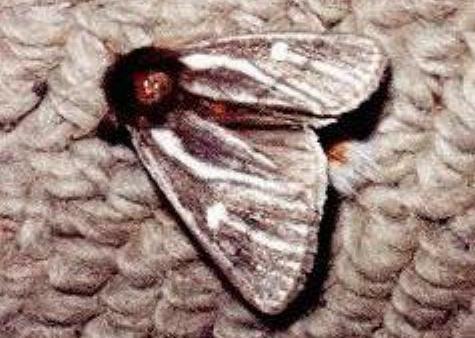 The moths have a yellow banded abdomen which ends in a white tuft of hairs. These and the hairs on their feet can cause Urticaria. It is unwise to handle the moths directly. 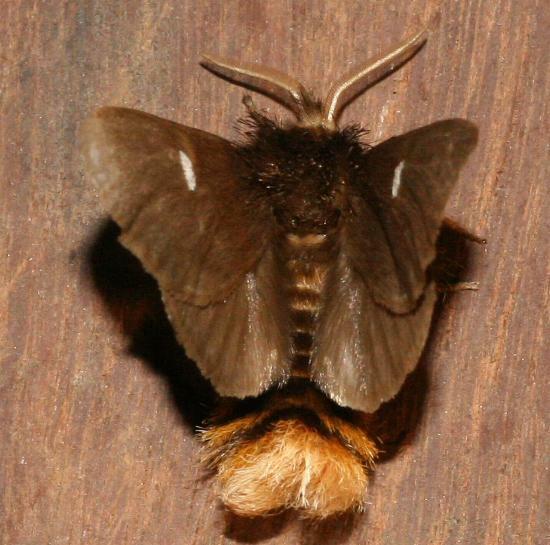 When disturbed, the moths are inclined to lie still on one side with a curled abdomen, so appearing dead. Some have white lines across the wings. Again, the variety of colour forms suggests that there may be more than one species present in Australia. Female adult moths lay several hundred eggs, and lay their eggs in one mass on a food tree. They cover them with a layer of hairs from their tail. 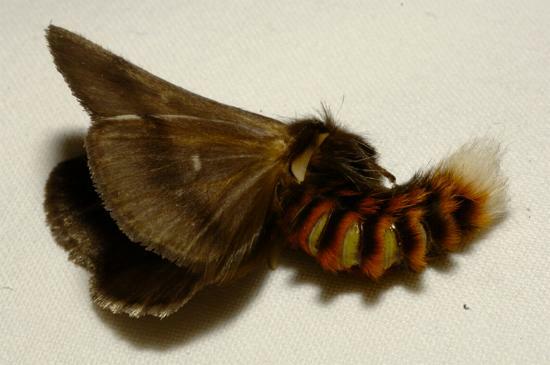 The female moths have no mouthparts and so die after a few days.